I, Rhea Emily Paskett on December 4, 1914 was born in Grouse Creek, Utah to George and Amanda Tanner Paskett. I am the eldest of three children, a brother, Robert and a sister, Afton. Robert was two years younger than I and then Afton was the baby sister. The first recollection I have of my home was when we lived down about a mile below Grouse Creek Valley. The home has since been removed. Dad used to carry me on his back as we’d come to church because we had to walk that distance up the valley to church. The next home that I recall was where my parents now live. 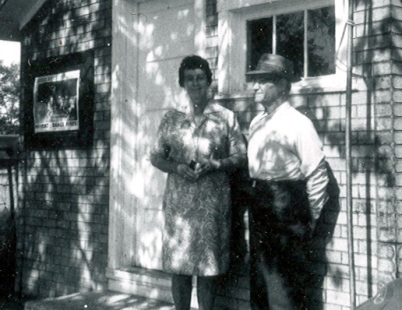 Although the home has been remodeled now, as I recall when I was a child it was made from logs that were hewn and they were on the inside of the building, and they were covered with factory cloth. In some of the rooms they had papered over the cloth. I recall as a child that the wind blew really hard and would wave the cloth as we’d sit in the room, in the winter time especially. Another recollection I have is that in the winter time, around Thanksgiving and Christmas especially, because these were important days to me, was that we had to wrap our water pipes with quilts if we’d go and leave the home for a day because the fires would go out, because they were of wood, and we’d have to wrap the pipes and this to keep them from freezing until we came home to build fires again in the evening. 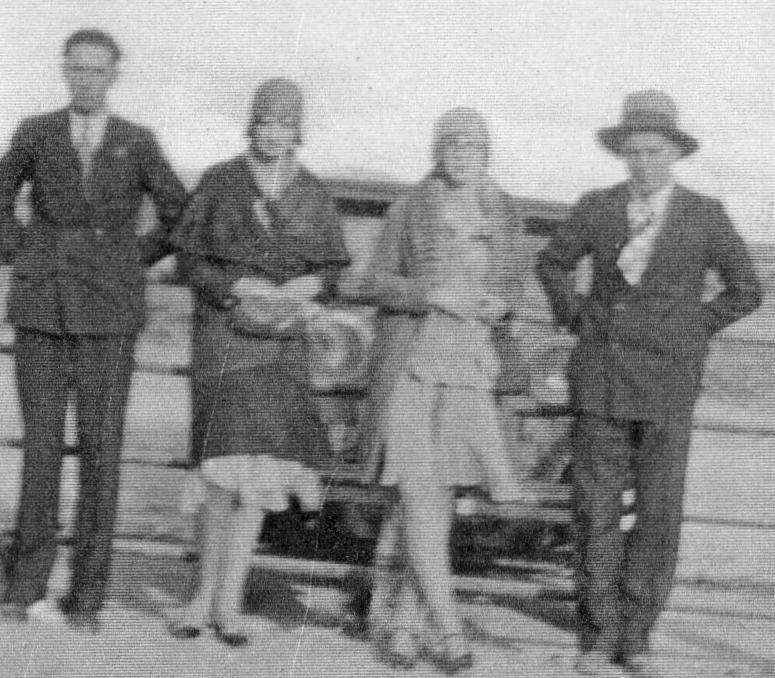 We spent the holidays when I was a child with my grandparents, Allen Newman Tanner and Mary Emily Barlow. They lived not too far away from us in a large brick home that we thought was elegant. They had a player piano and was one of the few homes that had carpet on their living room floor. We were not permitted to play in there all the time, and we thought it a treat when they’d open the door and let us in to be where the piano and the leather chairs were and the things that meant a lot to them. I remember as we’d go for holidays that was a little bit special, we’d pack up our dishes and take them with us because there was a large family. Grandmother used to have a cooker, they called it a steamer. It was square and they set it on top of the stove. She used to steam her puddings in it and sometimes they would cook their turkey in it. Grandma had a high ceiling, maybe around twelve feet high and they had a Christmas tree that reached clear to the top. We didn’t know what we were going to have for Christmas in those days. We asked for maybe one article and was really happy with what we did get. The gifts were not all wrapped and they were not all in under the tree but they were placed up in the branches just as far as we could reach to find them when they undressed the tree. Grandmother and grandfather would go to Ogden, Utah on the train. They’d go to Lucin and catch the train, the Southern Pacific Railroad, and when they came back their suitcases were bulging with goodies. We weren’t allowed to look till Christmas time but when the oranges, bananas, and treats came forward, we knew that this was what had come in the suitcases. We’d go and stay overnight and spend most of the time talking and laughing, causing the adults downstairs to sit up almost all night, waiting for us to go to bed. They were good times. We used to sleigh a lot when I was young in the winter time, to travel back and forth. We didn’t have a car until I was older, until shortly before I was married, and so this was our mode of travel, by sleigh in the winter time and walking otherwise. I remember Jorgenson’s and Wakefield’s stores when I was a child. I didn’t go to the Jorgenson store much but I remember Mother used to send us with a few eggs and we’d go up there and trade them for a bit of candy for our treat. I always liked to attend my church meeting, Sunday School, Primary and Religion class. I was never a task for my parents to get me to go. I’m thankful for this, and I’m sure it’s their teachings that was behind it. When I was going to grade school, a doctor came out from Ogden to test our eyes and without permission I decided to have mine tested. So, I went to school and had them test my eyes and he told me I had to have glasses so I ordered them. The next thing my parents knew, I was wearing glasses that had been prescribed for me, and I’ve worn them all my life since. I also had my tonsils out. 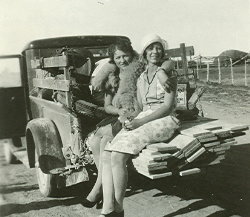 They were taken out at the home of Aunt Lizzie Cook by Dr. Leonard from Ogden. I remember I went home and I really wanted something good to eat, and I asked for some raspberries. They didn’t taste nearly as good as I thought they would. I spent my entire life in Grouse Creek. After attending school there, I graduated from the tenth grade. It was at this time that parents were beginning to send their children away to complete their high school, but it was not my privilege to go. My parents were not financially fixed to send me, and so I didn’t complete my education any farther than the tenth grade. I had hoped all the time that I maybe could take a beauty course, as I did like to work with hair. If there was a special dance or something, I had maybe ten ladies that would come and ask if I’d finger wave their hair. There was no curlers then, a few bobby pins, but we didn’t put it up in pin curls, we just finger waved. I would get ten cents a lady. I really thought I was rich. My uncle, Shorty Betteridge, had a curler that he used to marcel hair with and I remember the holidays down at grandmothers’ when they’d get this marcel iron and put waves in their hair. The marcel iron was a lot like a curling iron which they’d put in the top of the lamp and the handle would fold out on a hinge so that it would sit on top of the kerosene lamp chimney. As it got hot enough to do hair, they’d fold these handles together and twist their hair up and roll it up on this curling iron and it would set the curl in their hair. I had braids when I was a young girl and my hair has always been red. I’ve been accused of make-believe but not until the last years have I brightened it up a bit, but I’ve always had red hair. 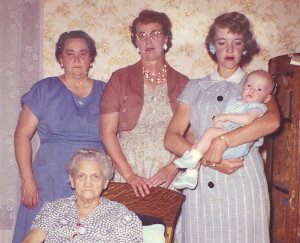 I liked to visit older people and I spent a lot of time with my Grandmother Tanner. She gave me a lot of good sound advice. I was her oldest grandchild, and I always like to think her favorite one, but perhaps someone else would contest this. I didn’t spend as much time with my grandparents on my father’s side. My grandmother was heavy set and it was hard for her to get around. She carried her English ways with her. My Dad used to ask me to make an English pudding that his mother made. I recall she was noted for the way she cooked cabbage. She put salt bacon in it and it was very tasty. She was very precise in her eating, always to cut her slice of bread into four, into quarters, and very neat in these ways that they had brought with them from England. I visited a lot at the home of Winfred and Olive Kimber. Winfred would always make “Winfred’s candy” for us. I also spent time visiting with Del and Ella, another aunt and uncle, and my “Uncle Rone,” Moroni Tanner. He was a bachelor and he lived in a little house up on the hill west of grandfather and grandmother Tanner’s. He had a mandolin and a guitar. I don’t think he ever knew what tune he was playing, but he always was willing to play a tune for me. I’d spend hours up there. Under his bed he had a bin that was just the size of his bed, filled with rye and I can never remember it being empty. He had an old trunk in his cellar and a few times he would open this trunk and show me some of his prize things. He told me if I’d learn to play, that he’d buy ma a ukelele and before I was out of school he bought me one and after I had learned to play it he gave me his guitar. Then he gave me his mandolin, but others borrowed it to play and it was never returned. I played the guitar for a while just for my own amusement, and then decided to get a bass uke. When I was still in grade school, my parents went to Nevada in the summer time to stack hay for the Utah Construction Company. They did the haying at San Jacinto, Nevada, and at the Grandview Ranch. Some of the Summers I went with them to help mother do the cooking, and some of the time I stayed here and took care of the garden. It was at the time when we first got pressure cookers and I had a lot of responsibility at that time, under the tenth grade age. I picked a bushel of peas at a time, shelled them, and pressured them and the same with beets and other garden things. That today, is something that a lot of the girls are not taught in the home. We had a milk separator at home and I used to wash it when I had to stand on a box or a stool to be able to reach the dish pan because we didn’t have sinks. Mother used to place the separator in the dish pan for me and I’d wash it. I didn’t mind doing dishes but I did get tired of doing the separator. We made our butter in an old wooden churn and also made our own ice cream. Dad used to cut ice blocks over to Mides Pond. They’d take the ice saw, cut blocks out of the ice and put them in the ice cellar. They’d pack them with straw and that was the only ice available in the summer time. We used it sometimes to put in water to cool our drinking water, but this is what we had to make our ice cream. At that time store bought ice cream was not available to us. We didn’t know what it was, and it was a treat when it did come. Now we revert back and go back to making ice cream because that’s the treat. My father used to butcher our meat, cure it in salt brine, put it in large crocks and store it in the basement where it would stay cool. This helped to preserve the meat because before refrigerators was here in our community and you killed a critter you had to cover it over in the shade, keep it cool, eat it as fast as you could or preserve it so it wouldn’t spoil. I’ve helped to render lard from the pigs that were butchered. We would grind it with a food chopper, put it on the top of the stove and render it out, strain it, and make soap. We used the soap to do laundry and it was good to clean with. I remember my parents cooking soap on the stove, setting it and cutting it into blocks then storing it away in a box. When we got ready to wash we’d put it in a can with a little bit of water and melt it so that we could pour it into the washing machine. My folks had a washer that we used to take the handle on the top and push back and forth and that’s the way we washed our clothes. We had a scrubbing board, too that was hard on clothes but cleaned the clothes good if you put lots of elbow grease behind it. We’d fill our tubs with water to rinse the clothes with blueing in it. We had to be self-sustaining in all these things, in our entertainment, food processing, sewing and these were all talents that were carried forward. Carpets were woven to cover the floors. They had rag bees where they’d take their old rags, tear them up, sew them together, make them into balls ready to braid their rugs or to put them on the loom. Aunt Lizzie Cook had a carpet loom. She would string it with carpet warp and they would weave carpet strips that made a good floor covering and made it warm. I think the Lord must have prepared the people that came here to be this way. They didn’t lack in talents of any kind, as far as things that they could do for themselves. They could make candles and preserve every little thing they found a need for. We had cobblers that mended shoes. They could tan their own leather. There was always someone that was talented to do these things. Albert F. Richins and David H. Toyn had forceps that pulled our teeth. It was too hard to go to a dentist. We had to go to Ogden on the train and when we did that it meant a day to go to Lucin, a day to go to Ogden, a day spent at the dentist if you could, then a day to come back from Ogden and to come from Lucin in a sleigh if it was winter time. If not winter it was in a Model T or the Model A. There were blacksmiths in our community to take care or these kinds of things. We’ve had the talent of music in our community. We’ve always had an orchestra. Both adults and young people took part. I love square dancing, the Virginia Reels, Plain Quadrilles, Walt Quadrilles and the Handkerchief Waltz. We had a lot of masquerade dances. We always went to the dances with our parents. We didn’t have babysitters then. All the family went, even if they had to sleep on the bench part of the night. We’ve had Weight dances where you weigh and you pay a penny a pound for your ticket. We’ve had basket dances where they raffled the baskets with the lunch in them. We had dances where you measured your feet and paid so much an inch for the size foot you had. We had a dance very Friday night and the floor was filled. We had lots of children’s dances. Holidays never went by without one, always before the dance in the evening. We always thought we had to have a new dress for Christmas and for the Fourth of July if no any other time during the year. We had a choir. It just seemed that in every home music was important. The community was talented in drama. We used to have a lot of three act plays. We always had Christmas programs at school. Of course when I went to school there was 133 students that attended. Socially, when I was in my teens and growing up, we did a lot of our own entertaining, so this was not costly. We’d go to one another’s homes in crowds. We’d put puzzles together, play cards, make candy or ice cream. At one time we even danced in the basement of the Hadfield home. It seemed we were satisfied with what we had. We were a little community isolated off by ourselves and we enjoyed it. We visited each other’s homes I think it was a good place to grow up. 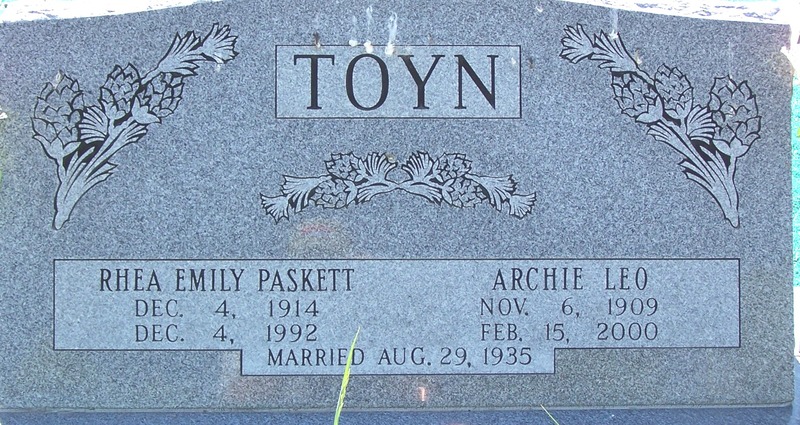 I grew up knowing Archie Toyn all my life and on August 19, 1935, we were married in the Logan Temple. Archie’s folks went with him. We went to Brigham and stayed all night. His parents had Effie’s tonsils out, and then we went and were married. We took a little trip up through Clarkston, visited Martin Harris’ grave and things like that and came home. We lived in a one room at the Toyn home. It was a large room and Archie had already bought furniture. He bought furniture at Boyle’s Furniture store in Ogden. He bought a breakfast set, a little table and four chairs. He bought a steel bed, a cook stove, a kitchen cabinet, a set of dishes. We carried water so we bought us a set of enameled cookware and a water bucket. We had a wash dish and a little stand to put the water bucket and the wash dish on and that served as our sink. We sent to Spiegel’s catalog and bought a wardrobe. We borrowed money from the F.H.A. and bought us nineteen milk cows. We paid that money back by selling cream to the creamery. We separated the milk and shipped the cream by the railroad in five gallon cans. We received anywhere from $3.50 to $5.00 for a can of cream. After that we lived in the Hadfield home in two rooms for one winter then we bought us a little home. We moved down just south of the cemetery and bought a little two-room home that belonged to Johnny Richins. It had an acre or two of ground with it and there we were on the pipeline. We had no bathroom facilities yet and we still didn’t have the electricity. We redid the walls and fixed this up and lived there until we built our home up by Hadfields’. We had Wellie Richins build it and the lumber and labor cost us $500.00. Afterwards, as our family grew Archie added onto this house. Archie and Rhea became proud parents of two daughters, Marlene and Gail, and one son, Devon. Heartache came early to them when their son passed away at the Kimber reunion dance. He suddenly slid from the bench he was sitting on and in spite of anything that anyone tried he did not survive. He was only eleven years of age at this time and no cause of death was found. This was a great sorrow to Rhea for the rest of her life. She always had a hollow place in her heart. She served in the Presidency of all the organizations, was a teacher in Sunday School, Primary, and MIA, and was also a chorister and dance director. 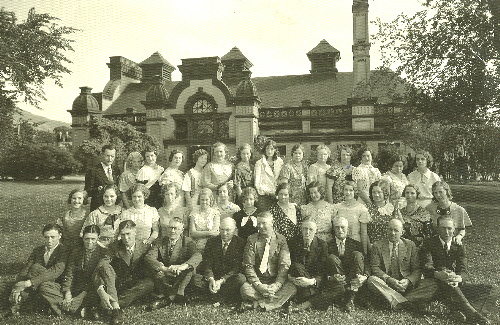 She was a member of the Ward choir and sang with the Relief Society chorus. 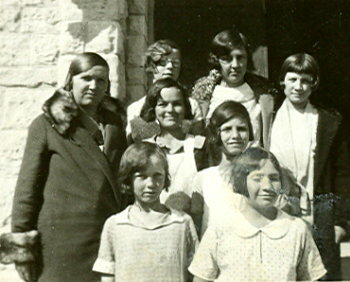 Rhea served as counselor in the Relief Society Presidency for eighteen years with Ella Tanner as President and Martha Kimber as the other counselor and Olive Kimber as secretary. This was a very enjoyable time of her life. They put on many hours of entertainment for the people of the Ward, having fun and enjoying every minute of it. They were well known for their clever skits and drama. As Compassionate Service leader in Relief Society she enjoyed visiting, especially the Senior Citizens, and caring for their needs. If anyone needed help Rhea was always there to see to their needs, not just because of her position in the church but just because that was the way Rhea was. 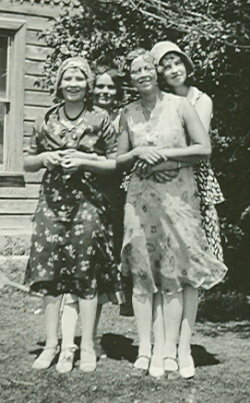 Rhea and Archie spent many enjoyable family home evening nights with their relatives, Winfred and Olive Kimber, and Lyman and Eula Kimber and families, many times at the Red Top cabin where eating and singing and visiting was the order of the night. Rhea was employed at the local Co-op store for a short time. She later was a leave replacement at the Post Office for Olive Kimber, then served as Postmaster for twenty-four years, retiring in 1991. She was known as the “Whistling Postmistress.” She was very conscientious in carrying out her postal duties as well as constantly showing love for her fellow men. We could not enumerate how many problems she has shared, how many people have been cheered by her, how many burdens made lighter or how many days have been brightened by her cheerful personality. She has listened to stories of sadness and gladness, passed out candy to young children, administered band-aids for skinned knees, and wiped tears from a small child’s cheek. Each Christmas would find the Post Office decorated with candy to be shared with everyone. During this time she was always faithful to look in on Winfred and Olive Kimber to see that their needs were taken care of. After Olive’s death she continued to check on Winfred every morning when she went to the Post Office, which was a great blessing to his family that lived out of town. Rhea was diagnosed with cancer. After undergoing major surgery, chemotherapy and radiation, it proved to be to no avail. In spite of her pain and discomfort she worried about the needs of others, kept a wonderful attitude and tried to stay cheerful. Rhea passed away at the home of her daughter, Gail, in Roy, Utah on her birthday, December 4, 1992. She was interred in the Grouse Creek Cemetery.